Nalle (Nordic word for teddybear) consists of Hanna Tulikki, Aby Vulliamy and Chris Hladowski. Their music uses unusual instruments to creative a weird amalgam of folk and other styles. Hanne Tulikki’s striking vocal is childlike and feral like Björk can be, or maybe Joanna Newsom. “Iron’s Oath” is sweet and heady, all odd string instruments being used in inspired fashions. “Sea Change” begins slowly with Tulikki’s singing throatily and the others following her lead. “New Roots” weds traditional folk to newer sounds with intoxicating results. There’s even an Asian influence at play. 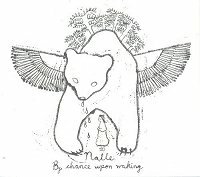 Nalle’s record is a remarkable thing.